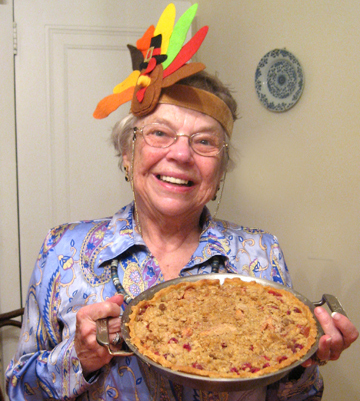 Aunt Lura (in seasonal headband) poses with the cranberry apple pie. 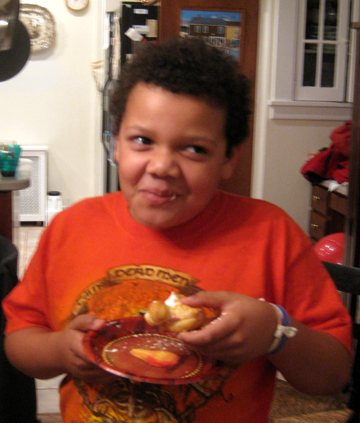 Like most Americans, my family can’t imagine Thanksgiving without pie. 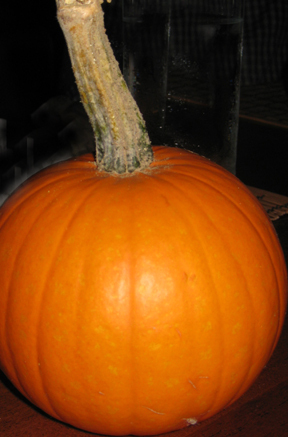 My Aunt Lura volunteered to bring a pumpkin creation to our table Thursday so our side of the family only had to make two pies. We knew my honorary cousin Eric was coming so we baked our favorite key-lime pie. Eric is the nephew of my late wonderful semi-godmother Dagny Johnson, who lived on Key Largo, so we HAD to celebrate the Florida Keys. We also wanted to celebrate our local bounty so we made another pie with two fruits native to both my home state, Massachusetts, and mother’s home state, New Jersey—apples and cranberries. I had the not very bright idea of making the pie crust with apple cider instead of water to enhance the apple flavor. It DID help the flavor. It also made the crust much harder to manage! So I don’t suggest it. Just use your standard pie crust. 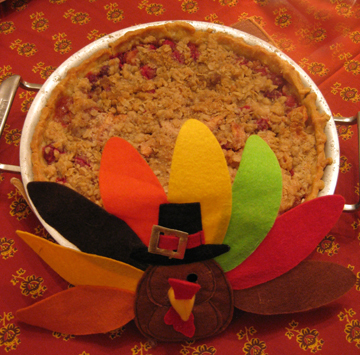 Aside from the sticky crust, everything about this pie proved a success—the apple-cranberry ratio, the rich crumb topping, the contrasting textures. My family highly recommends it. Preheat the oven to 425 degrees. In a medium bowl combine the sugar, cinnamon, salt, and tablespoon of flour. Add the fruit and toss to combine. Pour this mixture into your pie shell. In another bowl combine the remaining flour, the oatmeal, and the brown sugar. Cut in the butter. Pour this crumbly topping over your pie. Bake the pie for 10 minutes; then reduce the oven temperature to 350 and continue baking for 30 more minutes. Serves 8. As I type this Tuesday evening I am surrounded by red. I’ve been playing with cranberries today. I can’t resist their deep, rich color and their sweet/tart flavor. 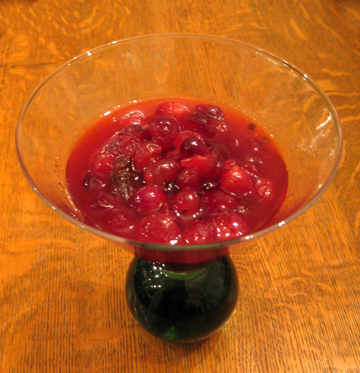 I tried making cranberry vinegar (NOT a success–I’ll try again next Thanksgiving). I made jellied cranberry sauce for the cranberry cream puffs my family plans to serve at a party on Friday (recipe to follow). And I made gorgeous, delectable cranberry chipotle sauce. 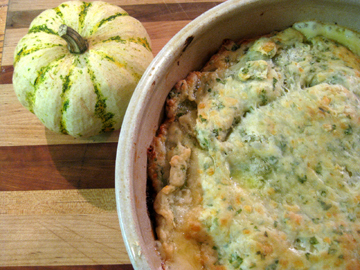 Instead, it’s scheduled to accompany crackers and soft cheese as an appetizer for Friday’s party. Naturally, my family had to try it this evening. After all, we wouldn’t want to serve something to guests that didn’t pass our own test. And to tell you the truth, I tried making it last year with limited success. I diluted the basic cranberry and chipotle flavors with too much onion and garlic. A cook shouldn’t mess with her cranberries! Now that I have learned that lesson, here is the simple recipe. You don’t have to make this sauce for Thanksgiving–but it might inspire you to host your own party this weekend (or just sit at home and eat it with leftover turkey). 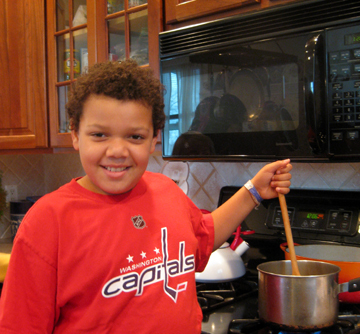 In a nonreactive saucepan combine the water and sugar over medium heat, stirring constantly until the sugar dissolves. Bring the mixture to a boil. When the sugar water is boiling stir in the chopped chipotles, sauce, and cranberries. Return the mixture to a boil, reduce the heat, and simmer for 10 minutes (stir occasionally). Pour the sauce into a bowl, cover it, and let it cool to room temperature. Refrigerate until ready to use. 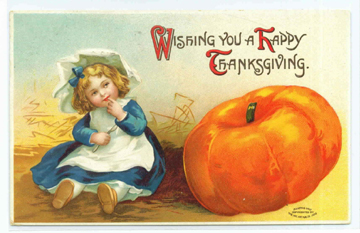 With Thanksgiving just around the corner, I’m ready to devote a few words to pie. 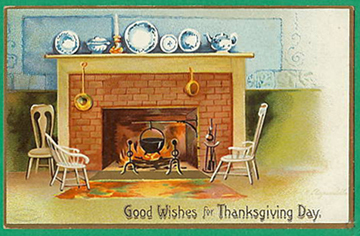 Turkey is the center of the traditional Thanksgiving dinner. 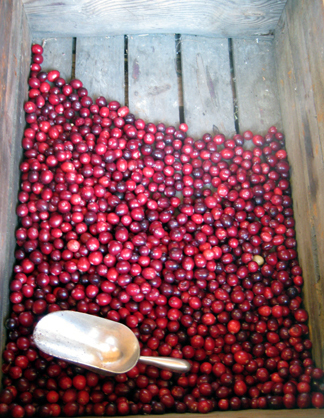 Cranberries are the jewels that adorn the table. But pie is the not-to-be-missed culmination of this late November feast. It arrives with fanfare and seldom disappoints eaters. Why pie? Like Thanksgiving itself it’s old fashioned. And (again like Thanksgiving itself) it represents a fair amount of work. Most of us don’t roll out pie crust every day so when we do it’s an event. At their best Thanksgiving pies are a family effort, made with love and many hands. 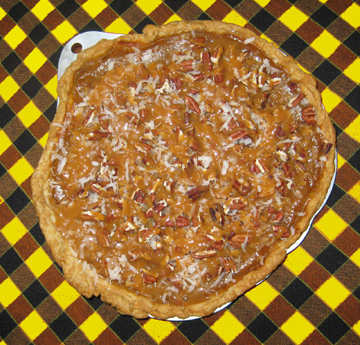 Pie is also ideal fare for this time of year when skies darken and breezes blow. 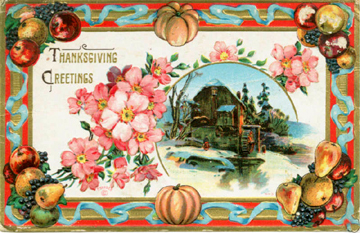 It fills us, warms us, and comforts us as November chills our bones. It would be great for Thanksgiving Eve, however, or for one of those days after Thanksgiving when you just can’t look at a piece of turkey any longer, let alone consider eating it. 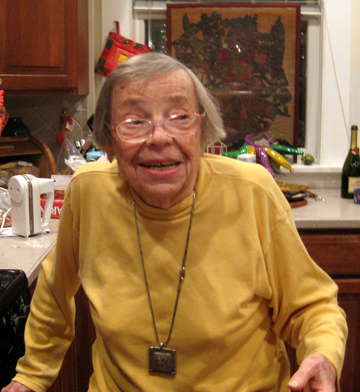 This ham pie is adapted from one created by Lucinda Finck of Heath, Massachusetts. 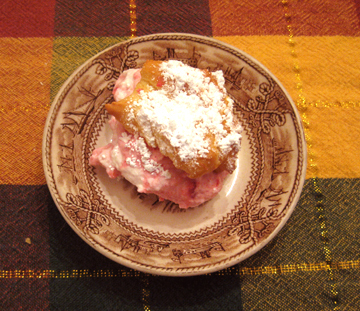 I found it in The Heath Fair Cookbook, a staple of my cookbook shelf. If you don’t have fresh herbs to include, you may do without them or use a smaller quantity of dried herbs. The fresh ones really do taste wonderful in the pie, however. First prepare the filling: melt the butter. Blend in the flour, salt, mustard, and pepper. Add the onions and milk. Cook until thick. Stir in the ham, egg pieces, vegetables, and thyme. 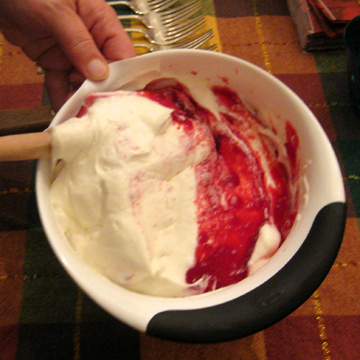 Pour the filling into a 2-quart casserole dish. Next, make the pastry: in a bowl combine the flour, cheese, salt, and parsley. Cut in the butter. Add the water until it forms a ball, and gently roll it out on a lightly floured board until it is large enough to cover the casserole dish. Place it on top. Bake the pie for 20 to 30 minutes, until most of the crust is golden brown and the filling bubbles. Serves 4 to 6.